Perilla frutescens is a pretty weed, but apparently here in Tennessee, it's pretty toxic to cattle and other grazers. FYI, the shrub in the background is Viburnum dentatum 'Pearl Bleu'. The herbaceous plants covering the ground are mostly native columbine (Aquilegia canadensis). Since I don't put mulch heavily or put down any weed-suppressing chemicals, I tend to have a lot of plants pop up in my garden beds. Some of them are the usual weedy scourges (crabgrass, spurge, clover, oxalis, etc. ), but sometimes there are plants I don't recognize and have never seen before. Sometimes, these unknown seedlings can be exciting volunteers -- like my discovery of a Sassafras albidum seedling this summer! And I'm pretty sure that my Viburnum dentatum (arrowwood) shrubs have produced a seedling, which I'll try transplanting in the weeks ahead. But then there are discoveries that initially seem exciting, but ultimately turn to disappointment. Such is the case with the plant shown above. I thought it might be one of the Scutellaria (skullcap) native wildflowers. I've only seen photos of those plants online, so I wasn't sure what would look like in person. Anyway, I had my doubts (the flowers from the Scutellaria photos looked much bigger than the blooms on my mystery plant), so I checked with an extremely helpful local expert (Amy Dismukes, UT/TSU Williamson County Extension Agent) and she identified the seedling as Perilla frutescens (beefsteak plant). 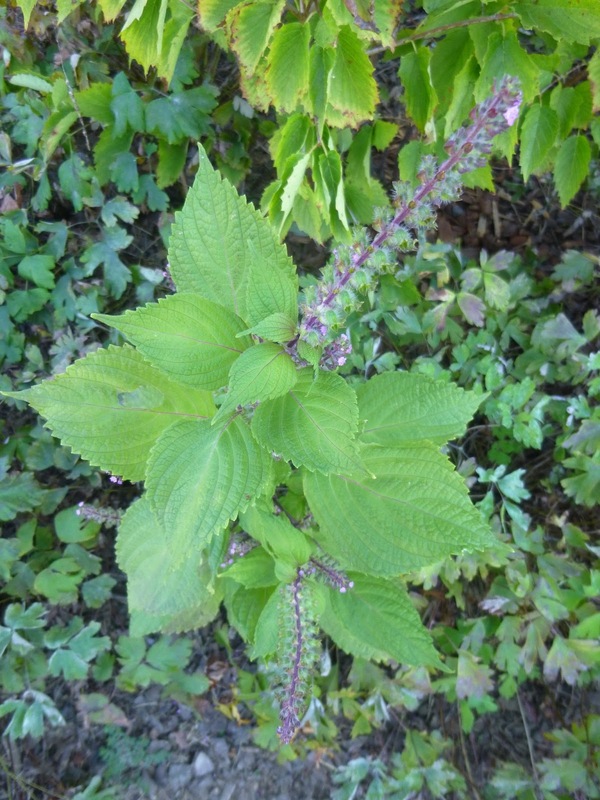 Now Perilla is native to Asia and unfortunately, it turns out that it is invasive in parts of the U.S., including Tennessee (according to the National Park Service). Could I have eaten it? I'm not sure. 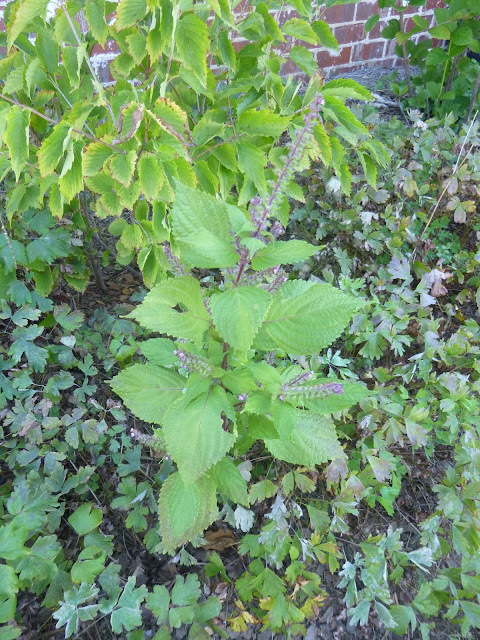 In parts of Eastern Asia (e.g., Japan, Korea, China and Vietnam), I believe that Perilla frutescens is used as an herb/seasoning. I'm pretty sure that I've eaten the occasional shiso leaf (as Perilla is called in Japanese cuisine) as an accompaniment to sashimi or chirashi. It had a very strong, distinctive flavor - not unpleasant, but I can't imagine eating more than a few leaves at a time. On the other hand, I presume/suspect that I was eating a Perilla cultivar that had been bred for edibility. University of Tennessee says that the plant is highly toxic to cows and horses, and in fact causes more cattle deaths in the state than any other plant. Meanwhile, a Purdue University paper cites research showing that a chemical compound called a ketone (Perilla ketone, to be specific) may be the culprit as far as the toxicity is concerned. Interestingly, Purdue notes that this ketone was found in P. frutescens samples from Tennessee, but not in seed from Oklahoma plants nor in commercial samples from Japan. 1) P. frutescens is evolving new chemical defenses here in North America. 2) Perhaps wild P. frutescens has always had chemical defenses, and the cultivated versions grown in East Asia had those defenses bred out of them by humans over a period of hundreds or thousands of years? In that case, perhaps the presence of the ketone in the Tennessee specimens is a reversion to a defense that had been lost? Wikipedia notes that wild North American shiso often has lost the fragrance that makes it a desirable herb and that these wild, weedy plants are not suitable for eating (due to the presence of the Perilla ketone). 3) Perhaps there is great variability in the species (the fact that seeds from wild P. frutescens plants in Oklahoma did not seem to contain this ketone lends credibility to this hypothesis) and it's luck-of-the-draw as to whether a given P. frutescens plant contains Perilla ketone or not. So, would I personally nibble a wild Perilla frutescens plant growing in Tennessee? And since this is a weedy, exotic invasive plant in at least some parts of the U.S., should you (North American readers) come across it growing in your yard, field or garden, I'd encourage you to remove it.